Not being in PR I am not used to news cycles but it seems that the gentrification of U Street is on a lot of people’s minds. In addition to my comment earlier this week, Borderstan talks about the all the businesses closing or leaving, Grtr Grtr Wash talks about the “rent is too damn high” and only partially joking. The ongoing drama around the operating costs of the Lincoln theater which can only get worse. Finally, The CityPaper tells us what to expect with gentrification. UrbanTurf chomes in as well. We hard about this a few months ago but I guess it’s going through. Donatelli has sold The Ellington. Bought by TIAA CREF that is a good secure investment for a pension fund. At the Lincoln Theater, the death throes continue. Jim Graham got everyone in a tizzy with his press realeases and statements so they had an emergency meeting of the board to determine what to do. I have not heard a resolution yet. They are appealing to the Mayor for Operational funds as opposed to Capital expeditures that Arena and other stages applied for. It costs the theater $60k per month to stay open and pay the 6 full time employees. Currently they have $50k on hand. It doesn’t bod well for them or the new Howard theater when it opens……. While urbanists surely pine for an “artisanal woodworker who makes specialty wine racks out of salvaged debris” (you can’t make this stuff up!) to set up shop, none of them seem to be taking advantage of the land. I think that is a good way to make fun of ourselves. http://www.walkscore.com/ now has cool new commuting software. You input your office address and it will calculate when you can live to stay within a 30 minute commute using verious methods: Metro, ca, bike, walking. I think it’s really cool. New Purchasing option: The greatest complaint nowadays is the banks mandating 20% down on new mortgages. UrbanTurf reports that local bank BB&T is offing 10% mortgages which is good news. Refinance? Interest rates are 4.01% How crazy is that? And they are having trouble finding people qualified to refinance. This is a great opportunity to save money on you mortgage. I am thrilled that my warnings about over development in the neighborhood was taken up by the City Paper. JBG, a big owner of land in our neighborhood, is worried that too much housing is coming online. As the leading owner of property in and around U Street we depend on their positive outlook for growth to continue building on the lots they own. I hope they see the area as continually profitable…. The Giant on 8th closed while I was away so I did not write that much about it but I was happy to hear that there will be an extended stay hotel going into the new complex there called CityMarkt at O. When it ever gets finished it should be great but I feel it will be a long 2 years. Snuck up on me…. I have to say this new restaurant just popped out but they have been dong so much on that block (U btw 12-13) it’s hard to keep track. PoP has a good comment on abandoned buildings. If they have to sit empty, is there some way we can allow artists to use them? I know developers hate it when a mural goes up because that means they cannot cover them up when the finally do develop them. A similar issue was raised with the Black Family Reunion mural at 14th & W. The developers are going to reconstruct it on the new building when they finish. Left For LeDroit has some good comments on the Howard University 10 year plan and neighborhood concerns over vacant buildings. They have a point. There are several buildings between 7th & 9th owned by Howard that just sit empty. Is there some way to grass them over or develop them? Passings . . . . Many people havcing been talking about closings in the neighborhood. As far as i can tell they are not based on the poor economy but rather on the success of the neighborhood. Mid City Cafe, Pulp, Miss Pixies and Rough & Ready have all declared that they are leaving the hood. I am sad to see them go because i really enjoy their quirky offerings. BUT think about it. These stores thrive on cheap rents and emerging neighborhoods. If rents increase, they need higher volume or higher prices. The volume is maxed out by the amount of space and no one wants to pay a high price for the same thing they bought cheaply before. It’s time to say U and 14th may have arrived. Retail along the street are successful and higher priced. It reflects the higher incomes of residents and additional foot traffic. I am sad to see these stores go but hope they can find new neighborhoods where they can be profitable like the new location of Rough & Ready. An additional Note on the Lincoln Theater. I don’t know what to make of this. It has a killer location but it is too pricey for its own good. I have heard from some events people that it is cheaper to rent the brand new Harmon theater in Chinatown than the Lincoln. For all it’s charm, the Lincoln is old and expensive to operate. They either need to declare bankruptcy and lower fixed costs or sell to a retail outlet that could use the space. (I am thinking the restaurant Tao in NYC based in a theater with a 3 story Buddha on the stage.) I am not even including the new Howard Theater due to open shortly. How will U Street keep 2 theaters open???????? With an annual budget of about $60 billion, 250,000 municipal, employees, nearly 35,000 armed police officers, over 26,000 vehicles, and 656 miles of subway track, the sheer scale of New York City governance dwarfs most sovereign nations. That does make it larger than some nations…. Are there too many police forces? 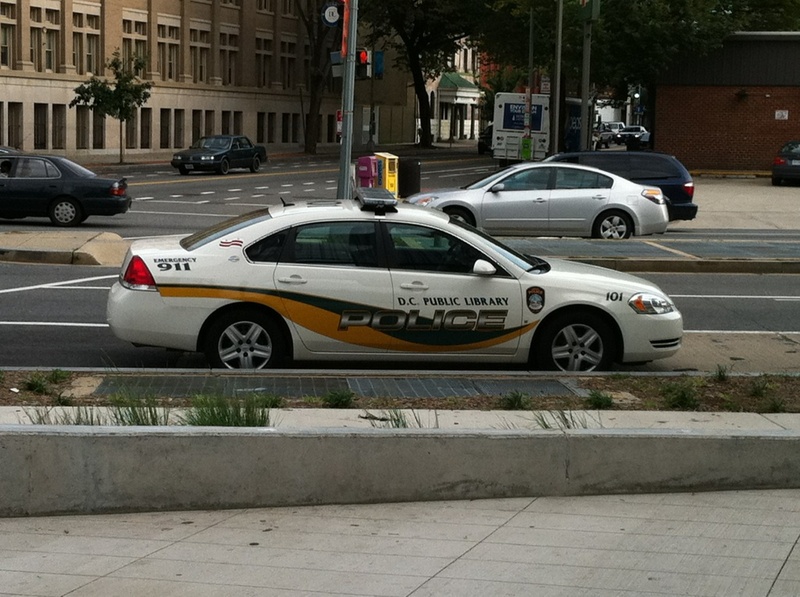 Did you know that the DC Public Library has it’s own police force? Is that really necessary?